"...I am beyond thrilled with my bathroom cabinet unit. They finished the install today and it is even more beautiful than I hoped for... Feel free to come take pictures - it is front page magazine worthy." "Just wanted to send you a big THANK YOU for helping us with our fireplace mantel. It looks awesome and definitely is a big eye-catcher to our living room... You guys definitely have quality workmanship, I wouldn't hesitate recommending you to my clients!" " The service you and Mantels Plus have given to us is first class...very friendly, polite, efficient and made the whole process very easy. Very customer focused/oriented and that is very rare these days"
"Thanks to all of you at Mantels Plus for the excellent service and product we have received. Your attention to detail and customer satisfaction were much appreciated." "..so pleased with the quality and craftsmanship put into the whole unit. Your professionalism and promptness of service have been a real pleasure doing business with.."
"..I also want to compliment the two craftsmen who did the actual installation. They were extremely polite, courteous and respectful... We have recommended your company to our friends if they require this type of service." 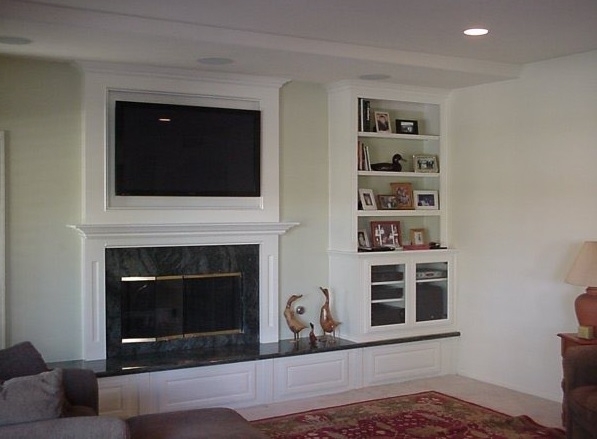 "...thrilled with the new fireplace and cupboards. It has changed our whole room! Thank you so much for all your help and your terrific workmanship. The renovation is fantastic."